I’m not really one to make New Year’s Resolutions. Sometimes I will set goals for the upcoming year, but I tend to think resolutions are fairly fleeting once the holiday hangover that is January has passed. This year, however, I’m considering making a resolution. There are several goals I have in mind for 2015, so why not make it official? The ideas I’m tossing around in my head center around four main topics: health/fitness (surprise, surprise), writing, parenting, and giving back. Want to vote on what my resolution should be? Writing. I enjoy this blog. It keeps me writing fairly frequently, but I have always wanted to do more. Exactly what ‘more’ means is kind of a toss-up. Write a children’s book? Become a contributor to other blogs? Simply find greater success with my own blog? And whether success with my own means more page views or simply feeling like I can truly write what I want to write without holding back … I’m just not sure yet. Which is why formulating some kind of resolution around writing could really be what I need to get motivated. Parenting. Yikes. This is the hard one to discuss on a public platform. But it’s probably the most important goal I have, whether or not it becomes a resolution for the new year. I want to do a better job! Balancing work, responsibilities, and relationships is tough. I feel like my kids get the worst of me (and vice versa!). The most time we spend together during the week is during the proverbial ‘witching hour’ … something we have discovered does not only apply to kids. We parents are worn out and cranky at the end of the day, too. I really want to find a way to dig deeper and make those few short hours we working parents have with our kids THE most joyful time of the day for all of us. 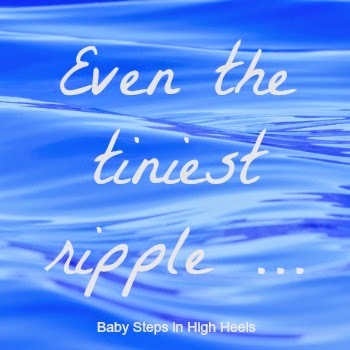 Start Making Ripples ... Taking into consideration everything I have already listed, it’s no wonder we find little time to give back … to each other, our family, our community, or those around the world in need. I constantly find myself feeling like a failure because we tend to do the very minimum. I’d like to do more, but it has to be something we can handle. I have finally updated my Even the Tiniest Ripple tab up in my header. It's something that I wrote a while back, and now that I am looking at it again, I've realized that it actually encompass several of the goals I've outlined above ... which I suppose should be a really big hint. Hmmmm. So, what do you think? Knowing myself well, I know that I will focus on all of these things in the coming year … but should I pick one to be an official New Year’s Resolution? If so, which one? And, do you have a resolution? Please share! 2014 was the first year I didn't do a list of goals. I felt led to choose a word instead and focus on that. It encompassed many aspects, and I decided to go that route again for 2015. Maybe you can think of a word to umbrella all of these under. Love this idea, Mrs. Gray! I'll let you know what I decide!